About a year and a half ago, I sent an article I had titled ‘The Placebo Secret: why alternative medical “treatments” work’ to The National; the editors published it but changed its title to “A case for alternative medicine in the mind”. In the article, I started by stressing how worldwide the belief in alternative/complementary medicine is, including but far from limited to the Arab-Muslim world. I then went on to report on studies regarding the effectiveness (to what extent and how) of alternative treatments. Today, more than yesterday, millions if not billions of humans everywhere resort to “alternative” medical treatments, which range from drinking special infusions to acupuncture, bloodletting, homeopathy, yoga, zen meditations, and of course chicken and other soups. Most people who use these treatments swear (honestly) that they work. And they do. What? A hard-core scientist who says that “alternative” treatments like bloodletting, homeopathy, and chicken soups work for curing illnesses ranging from anemia and migraine to ulcers and high blood pressure? That is going to get me cited (approvingly and disapprovingly) in many places! But before I explain my views, I should add an important caveat: these treatments work for a while and only when one really believes they will work. In this post, I would like to highlight another phenomenon which is also worldwide, but it is largely prevalent in the Arab-Muslim world. I am referring to the strong preference shown by many people for herbal remedies, ranging from simplistic (“the black seed can heal from any disease”, more on this below) to quasi-scientific (“Bruise cardamom pods until partially open; remove cardamom seeds from their pods; gently bruise seeds or dry-fry over gentle heat to release their flavor [to] help relieve indigestion and gas”). What is one to make of such a social phenomenon, touching on science, at least some folk-style and traditional version of it, religion (a large collection of hadiths are brought to bear, and sometimes even the mere mention of a plant or fruit in the Qur’an is discussed at length), culture, and modernity/anti-modernity? As far as the Arab-Muslim culture is concerned, I think there are here at least two major trends at play: a) the strong will to go back to “our original identity and tradition”, including in the field of medicine (and science in general, as in the case of I`jaz, the “miraculous scientific content of the Qur’an”); and b) the wish to break away from modern (read: western) ways of life, which are seen as artificial (medicines are manufactured chemicals, not natural herbs). Let’s focus on the second trend, since the first one is a purely socio-religious one and is thus much more general than the present issue. It is difficult to argue strongly with people on this point because: first it is quite true that many (certainly not all, and perhaps not even the majority) of those herbs and fruits have tried-and-true medicinal value, and secondly we all know that most of our modern medicines have side effects and some of them even addictive characteristics. Ah, but one must be careful with generalizations and selective emphasis, and that’s where I think the problem lies with the above traditionalist views. Indeed, one must first stress that herbs and fruits can be good for the treatment of this or that ailment, but they rarely if ever have the wide spectrum of benefits that they are often given (recall the blanket statement about the black seed); secondly, many of those (natural) plants have side effects too, sometimes very negative effects, especially when combined without care; and thirdly, modern medicines are often merely extracts from herbs, where the scientific methods (systematic trials, rigorous experiments) have been applied to distill (literally and figuratively) the plant into its essential (molecular) beneficial nugget. Let me insist on the fact that “natural remedies” often produce negative effects, a point which is rarely realized or appreciated by the naturalists. A few months ago, newspapers reported that Europe [is going] to ban hundreds of herbal remedies, on the basis of safety concerns. 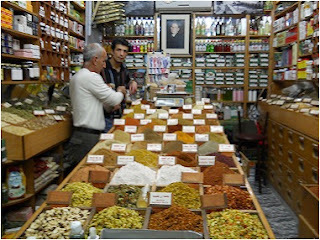 Indeed, starting May 1, 2011, hundreds of herbal medicinal products will be banned unless licensed or prescribed by “a registered herbal practitioner to comply with an EU directive passed in 2004” ; opponents have stated that such directives will be near-impossible and very costly to satisfy, which points to the wide gap between traditional and scientific standards. To sum up, I believe this is a very interesting topic because it raises various issues connecting science (systematic studies) with tradition, sociology, trends and attitudes regarding modernity, western products and lifestyles, etc. I’ll be interested to hear people’s views on all these aspects of the subject. Thanks for this interesting piece. I wish to note, however, that Herbal medicine had a much longer history and more scientific foundation than “Prophetic Medicine” (Al-Tibb al-Nabawiy). The Arabs developed it intuitively in Arabia but then considerably expanded it and systematized it, utilizing translations of Greek (Dioscorides and Galen) as well as Syriac (Ibn Bakhtishu') sources. During its heyday (9th-12th c.)it developed into a sophisticated science of pharmacology that rested on the conept of Gelenic humors. Later on, due to dogmatic pressures, it was subsumed (and perhaps reduced) under al-Tibb al-Nabawi, which is mainly what is practiced today. I just read your article in The National and I have to agree with you that traditional medicine works only when someone expects it to work (the placebo effect). I have many friends and family members that swear by the efficacy of herbs, acupuncture, bloodletting, etc. and I see no problem in that as long as they’re benefiting from it. But I’ve observed that they have to keep repeating their treatments or try other ones when the original benefits taper off. I have yet to hear that someone got completely cured using alternative medicine. As for myself, I’m with you in that I don’t think alternative medicine will work with me if I know it’s based on the placebo effect. Maybe to be denied a therapeutic benefit is a curse of knowledge, but in the long run I prefer knowledge to ignorance. I think the term 'Prophetic Medicine' is being misused with impunity to promote quackery which is becoming a multimillion dollar business in countries like Pakistan where people have strong emotional affiliation with religion. Prophet Muhammad (P.B.U.H.) did mention about many natural herbs and medicinal products in his sayings (like black seeds and honey etc.). But most of the medicinal effects of these are based on the knowledge and wisdom about natural pharmaceutical ingredients found in natural products, not something divine. As a later example, the early antibiotic Penicillin was extracted from rotten oranges growing penicillium mold in the last century. Penicillin, still used and very effective, is no more extracted that way. Same with the vast majority of drugs originally extracted from plants and later on ways were discovered to mass produce the same from synthetic means. Like the chemotherapeutic agent vinca alkaloid from vinca rose and Atropine from atropa belladona. 'Going back' to traditional medicine is like saying going back to traditional travelling on donkeys and camels...doesn't need an explanation or does it? Medicine is a field that has a history of taking baby steps and later gallops and strides forward for many thousand years based on trial and error, common sense, and knowledge. Contributions of early physicians based on herbal preparations is as important as present day high tech research. But there is no going back. And not all herbal methods of treatment are placebo effects. Yes placebo effect has some positive outcome but at a very very limited scale. You cannot heal a fractured femur through placebo...or can you? Personally speaking, I am one of the strongest advocates against publicizing placebo or traditional treatments as it creates a false sense of safety for common people with disastrous consequences. Thank you all (Yasser, Mohamed, and Akbar) for interesting comments and additions. Just one or two quick comments regarding the placebo effect: a) this effect indeed has limited applications, but we don't really know its limits, perhaps it does help (not fully cure, but perhaps help) even in fractured femurs, more research needs to be done in this area as to how the effect functions and to what extent; b) it was recently reported (from a study) that this effect works (again, to some extent) even when the patient is told that they are being given a placebo... as long as he/she believes it will work! I read your post and also the response of people and I totally agree with Dr.M.Akbar 'Prophetic Medicine' is being misused with impunity to promote quackery which is becoming a multimillion dollar business in countries like Pakistan where people have strong emotional affiliation with religion. Prophet Muhammad (P.B.U.H.) did mention about many natural herbs and medicinal products in his sayings (like black seeds and honey etc.